A Segmented Button Object usually acts like a group of radio buttons. but it can also act like a series of checkboxes (called Toggle mode). or as a series of push buttons (called Momentary mode). Start by dragging a segmented button object from the Object Library to the form. Then enter the name of of the field or variable that will be linked to the segmented button. Finally, switch to the Formula panel and enter the button names, separated by commas (you can optionally include spaces, as shown below). For a basic segmented button, that’s it … you’re done! There are three possible modes of operation – Radio, Toggle and Momentary. Radio – This is the default mode. In this mode the buttons act like a group of radio buttons. Only one button can be selected at a time. The name of the currently pressed button will be placed in the field or variable the object is linked to (see Data below). This also works in reverse – changing the value of the field or variable will change the button state (in the case of a variable, you must also use the showvariables statement). Toggle – In this mode, the buttons act like a group of checkboxes. Each time you press a button it will toggle on or off (hence the name), and multiple buttons can be selected at once. If multiple buttons are selected, multiple values will be placed in the field or variable the object is linked to (see Data below). Each value will be separated from the next by the text specified in the Value Separator option (see below). In this example, the Value Separator is a comma and space. The linked value is displayed in a Text Display object so that you can see what is going on “under the hood”. If the Value Separator is left blank then carriage return will be used as the separator. Momentary – In this mode, the buttons act as independent checkbox. Each button will highlight as you press it, but the buttons will not stay selected. The only effect of clicking on a segmented button in this mode is to trigger the procedure code associated with the object. This option specifies the data that is to be edited. You can either type in the name of a field or variable, or you can choose a field name from the pop-up menu (on the right). Panorama will also auto-complete field names as you type. Note: If you specify a variable that has not already been created with a procedure, Panorama will automatically create a global, fileglobal or windowglobal variable with this name the first time the form is displayed. The type of variable created depends on the Form Preferences. This pop-up controls how the formula is interpreted. See Dynamic Segmented Buttons at the bottom of this page to learn more. Value Separator – This is the text that will appear between each value in a multiple value list. Common separators include commas, spaces, slashes and hyphens. This option only applies if the Toggle option is used (see Mode above), for other modes the Value Separator is ignored. The Value Separator may be a multi-character separator like comma+space. Panorama X makes available all of Apple’s style options for this type of object. Normally the button’s segments are displayed at the minimum width necessary for each segment. If the Evenly Divided Button Widths option is set, the buttons expand to the entire width of the object, and are divided evenly no matter what the width of each segment name. If there are too many buttons, it will do the best it can. Size – Segmented buttons may be one of three fixed heights: Regular, Small and Mini. These are the only sizes available – see Cocoa Objects for more detail about the reasons for this limitation. 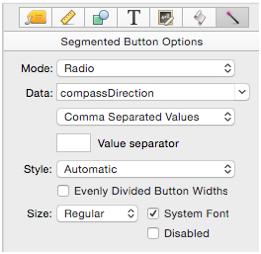 System Font – If this option is checked the segmented buttons will always be displayed using the standard system font and font size. Uncheck this option if you want to use a non-standard font or size (in which case you select the font and size from the Text panel, see Fonts). Of course there is no point in a button that is permanently disabled. So normally you would enable/disable a button with a procedure. See Push Button Objects for an explanation of how a procedure can enable/disable a button. The examples shown so far have been fixed – buttons that never change. 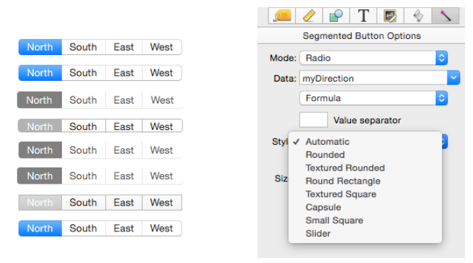 If you need a segmented button that can change dynamically, switch the object to Formula mode. You can even add or remove buttons. 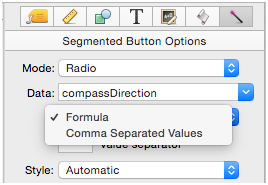 In this mode, the Formula panel actually contains a formula, instead of a comma separated list. Here is the revised formula for our compass direction example. Notice that now each direction is on a separate line, and also note the quote characters at the beginning and end, which are necessary to make this a valid formula. Then I can change the segment button formula to this same variable name. Now the button arrangement can be edited on-the-fly. In this example, the formula is very simple, just a single variable, but you can use as complex a formula as you need.